At Clear Lake Veterinary Service, we offer a wide variety of surgical procedures for your pet. From elective surgeries such as spays and neuters to trauma-related repairs, we provide quality technique, monitoring and care. Procedures can usually be scheduled for any weekday morning, and depending on the surgery, pets may go home that same day, or may be hospitalized overnight in our bright and spacious kennel room. Pets are NEVER discharged from this clinic in a groggy or sedated state. When specialty surgical expertise is required, Dr Engel makes use of surgeons at referral or specialty hospitals. 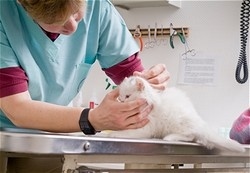 This option can be discussed at the time your pet is examined. We are fortunate in the Clear Lake area to be in relatively close driving range to board-certified surgical centers providing the best in high quality care for those more complicated cases.